Just like a brand new notebook that has never been opened, so a baby's mind, too, is pristine and new when they are born, ready to receive thoughts and impressions and all that the world brings their way. As each of us grows to maturity, the collections of our lives can be built into a beautiful work of art or a crazy mess of jumbled content. In the day-to-day of our lives, we tend to forget that though. Our cultural or personal norm can quickly cause our understanding of this truth to become clouded and we see the world through only our own narrow lens. When we see little children all around us who are happy and loved we may think a happy, carefree life is a natural aspect of human childhood. On the other hand, when we are surrounded by pain, we may feel that life itself, including childhood, is merely a cycle of cynicism, despair, hopelessness and fear. We, as parents, are largely responsible for these impressions our children form early on and for their worldviews which are begun to be shaped at birth. God has designed it so that even the poorest of mothers can provide all the tools a child needs to have a happy childhood and a meaningful, successful life. True motherhood is so much more than merely clothing and feeding a child. It is to teach a child of love, empathy, trust, respect and so much more. And we do it in the most mundane of ways, usually without conscious realization of the things we're teaching. While a school teacher has the benefit of opening a text book and preparing to teach the day's subject matter, the way a mother teaches often differs in one significant way. She may have no idea what the day's subject material will be when she awakes and yet the teaching will happen, whether she is prepared or not, and whether she realizes it or not. While at times this impromptu teaching may be uncomfortable for us, at other times we will have no idea we are teaching anything at all. Our choice to parent and teach to the best of our abilities, despite how prepared we may or may not feel, will have a lifelong impact on those in our care. 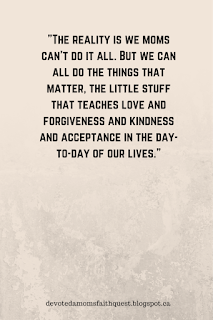 Just how much do these "little" things, these "impromptu" and "insignificant" moments matter? Consider the worth of a mother - or a father - and imagine, for a moment, how our lives would be altered immeasurably if we had never known the love of a parent (or parent figure). If, as an infant, no one had shown me that they would come when I cried and found out what my needs where, would I have survived? Would I have thrived? If no one had made time to play with me, to tickle and be tickled in return, to read me goofy books and make funny faces, where would I have learned of cheer and laughter? Had I never been disciplined for the unkind words I said, would I be empathetic today? If no one had leaned in to listen when my heart was hurting or kept a promise they had made, would I have learned to trust? If I was never rocked and cuddled when I was sick or sad, would I extend comfort to others? If no one had carried the groceries in and emptied all those bags late in the evening, only to get up early and put my breakfast on the table, would my body have been nourished? If no one had explained why Legos should be put away and books and blocks picked up, and had no one shown me where they went and how to put them away, would I be responsible today? If no one had ever read a silly bedtime book or a favorite story to me, told me what they liked about me, talked with me, and told me about when they were little, would I know the power of words and communication? If no one overlooked the spit-stained sleepers, the toys strewn everywhere, the imperfect art, the raging tantrum and the half-eaten cookie to see and love me behind the mess, would I still hide the real me today? If no one tossed me in the air, ruffled my hair, chucked my chin, or squeezed my hand, would I know the power of loving touch, the language of love? If no one whispered kind words softly to me when I was tired, called my name just to say I love you, or gave me a genuine compliment, would I know what words of affirmation sounded like? If no one had given me a candy, a simple note, a birthday card, or a treasured gift, would I show others the language of love through gifts? If no one had taken time to listen to my teddy bear's story, to hear the cry behind my angry words, to hold me when I was tired, to go on a walk with me, to ask about my dreams. .. would I understand the value of quality time? 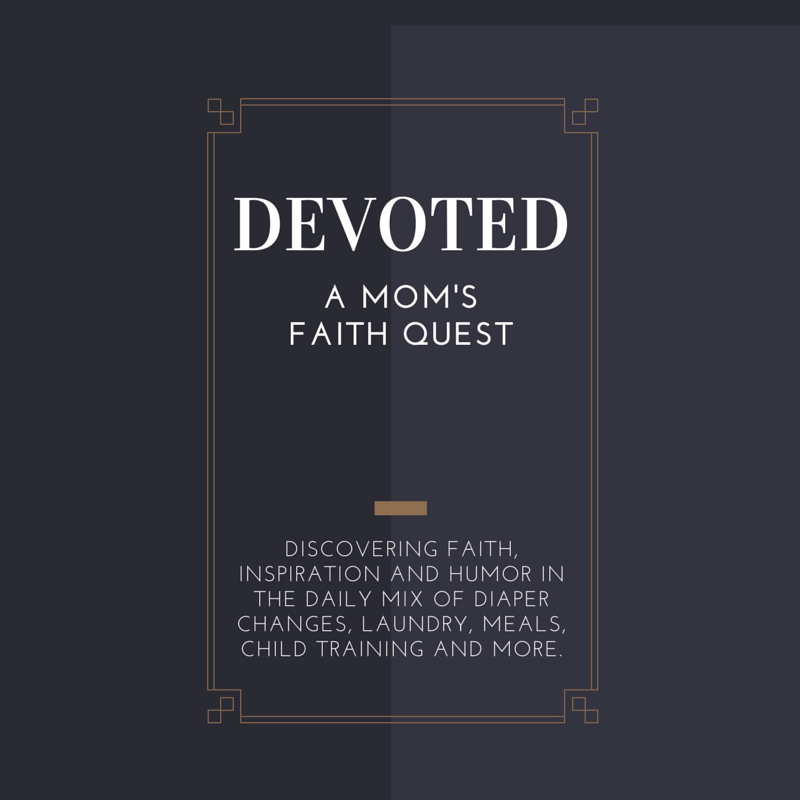 If no one ever sacrificed their needs or wants so I could have clean dishes, food to eat, clothes to wear, a special toy or a favorite story, would I value love's gift of serving? If no one held me close, cuddled me, disciplined me, rough-housed with me and chased me laughing through the house, would I understand that love is a many-faceted thing? If no one had taken care of me when I was little. .. changing diapers, wiping noses, turning dirty socks right side out and cleaning up vomit when I was sick, would I know love isn't always pretty or romantic? I don't know about you but I’m so grateful my parents taught me the things that mattered. And I don’t know how you feel but I do know it’s easy for me to be overwhelmed with all the things I "should" do for my children. The reality is we moms can't do it all. 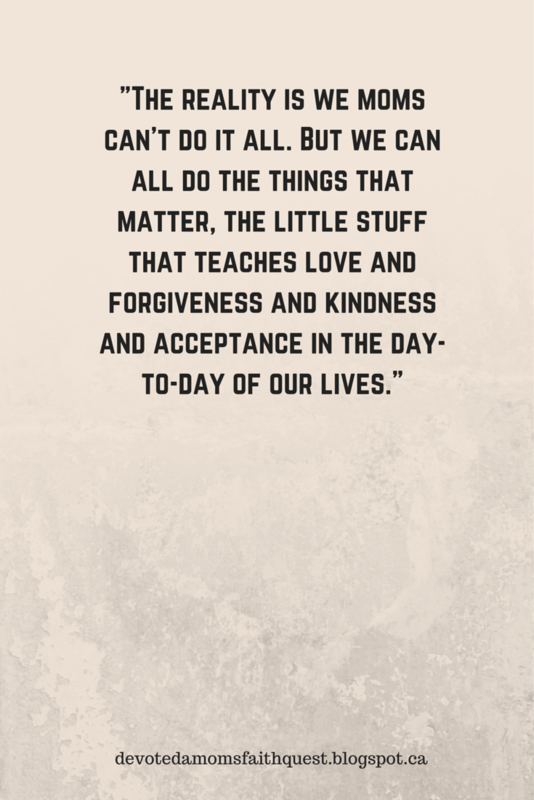 But we can all do the things that matter, the little stuff that teaches love and forgiveness and kindness and acceptance in the day-to-day of our lives. That's the kind of stuff I want to do.